I’m looking forward to the colors of fall…how ’bout you? Fall has it’s up’s and downs (No punn intended – LOL) Great tree! Thanks for sharing. I had the same thought today! Wonderful tree you’ve done here. 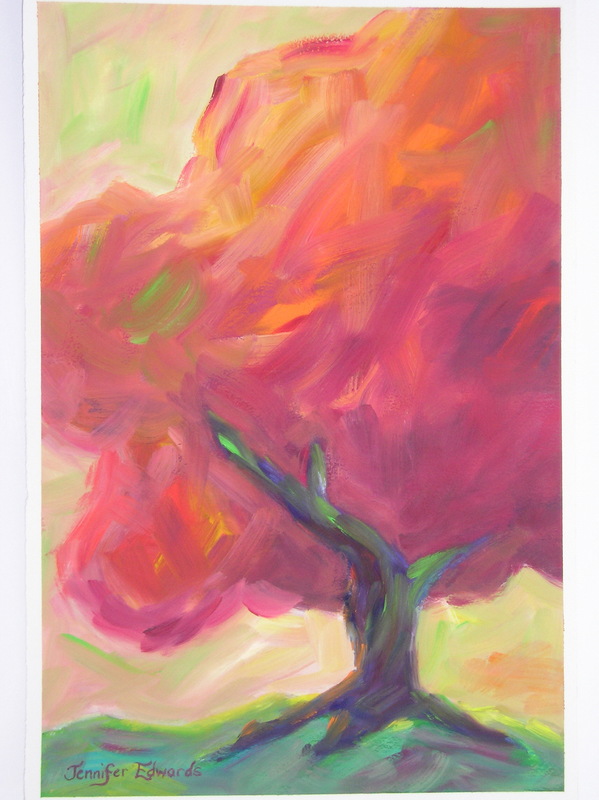 I like how the branches are cradeling the foliage – as if they are in love and so proud to share the colors. This is such a beautiful tree! The use of colors here is out of this world, and I can’t think any other word to describe it… MAGICAL! Thank you so much everyone! Your kind words are as inspiring as the autumn colors! I love your trees and choice of colors! This will be my first fall back in Texas after an eight year absence. We don’t get pretty colors in fall. But, when I was in College Station last weekend, I saw a few trees trying to turn yellow! I was so happy. Fall is my favorite season! That is an inspired tree! Lovely. When I saw my first REAL fall (I’m from Southern California…ours is very limited) I thought it looked like there were huge spotlights at the bases of the trees, they were so bright. Yours has that brightness. Just lovely….the one thing that I missed when I lived out west was the changing of the leaves…in Colorado we had the aspen trees but it just wasn’t the same…Mother Nature wearing her Autumn colors. Great color and very expressive brushwork. You’ve got me fired up – Fall is one of the more outstanding seasons here in the mountains of North Carolina. beautiful colors in your painting! I enjoyed looking through your blog for the first time today. glad I found it! !